Can Fans Sue UFC, T-Mobile Arena Or Khabib/Conor For UFC 229 Brawl? Home MMA Can Fans Sue UFC, T-Mobile Arena Or Khabib/Conor For UFC 229 Brawl? This past Saturday, we all saw what the fighting public loves more than anything else: a good old-fashioned brawl…and that was after the main event. That’s right, we all saw it. 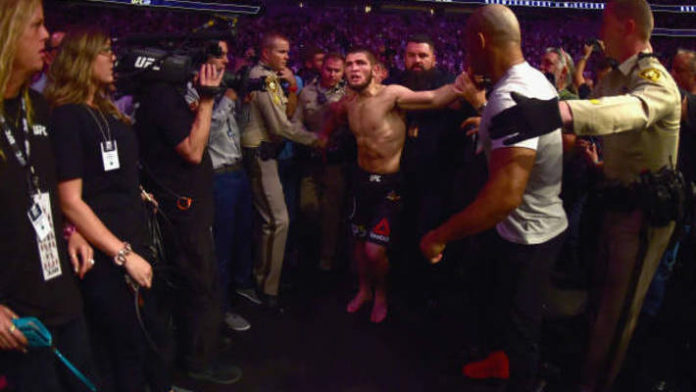 We all saw what happened after UFC Lightweight Champion Khabib Nurmagomedov defeated superstar Conor McGregor in their lightweight title fight at UFC 229. The sequence of events is sketchy, and authorities are still trying to figure out what actually happened. But basically, Khabib releasing months of anger and outrage, jumped the Octagon fence to presumably attack Dillon Danis, a McGregor training partner. Chaos ensued and before we knew it, both camps were at war. But at times like this, the question arises, can fans sue if they suffered injuries due to the aforementioned conduct? Generally speaking, the law of negligence dictates that every individual and organization must act in such a manner so as to keep those around them reasonably safe under the circumstances. However, what “reasonably safe,” means is hugely fact-dependent. In other words, if the UFC and/or T-Mobile Arena is putting on a sporting event, they must keep fans reasonably safe. They must take measures such as providing sufficient security and implementing other safeguards in case something goes wrong. The fighters must also conduct themselves so as to not endanger those in attendance. Again, the standard is reasonableness. Nobody expects any individual or entity to act perfectly. That would be impossible. But they must act reasonably. If they do not, however, the law sees whether or not those entities have a defense. That defense is typically referred to as the “assumption of risk doctrine.” This is commonly used in sports settings, such as when fans are hit by a baseball in the stands, or a hockey puck, for example. The same would apply to MMA. In order for “assumption of risk,” to apply, the defendants would have to show that the plaintiff had actual knowledge of the risk involved and that the plaintiff voluntarily accepted that risk, expressly or via their conduct. So, when MMA fans go an event, should they assume the risk of a fighter violently jumping into the stands? What if the event is expected to include a fight between two fighters hostile towards one another, as was the case here? Who knows, maybe these questions will be answered if someone files a lawsuit down the road. The bottom line is that such legal analyses are hugely fact-specific and subjective, but one thing isn’t up for debate: the next UFC event I attend, I’m sitting up top!